Description: Looking more like astronauts than aircraft pilots, members of a fully-suited NASA research flight crew is seen here alongside an SR-71 aircraft. Two SR-71A's were initially loaned to NASA from the Air Force for high-speed, high-altitude aeronautical research. The SR-71As plus an SR-71B pilot trainer aircraft were based at NASA's Ames-Dryden Flight Research Facility (later, Dryden Flight Research Center), Edwards, California during the decade of the 1990s. One of Dryden's SR-71s was used for the Linear Aerospike Rocket Engine, or LASRE Experiment. Another earlier project consisted of a series of flights using the SR-71 as a science camera platform for NASA's Jet Propulsion Laboratory in Pasadena, California. An upward-looking ultraviolet video camera placed in the SR-71's nosebay studied a variety of celestial objects in wavelengths that are blocked to ground-based astronomers. 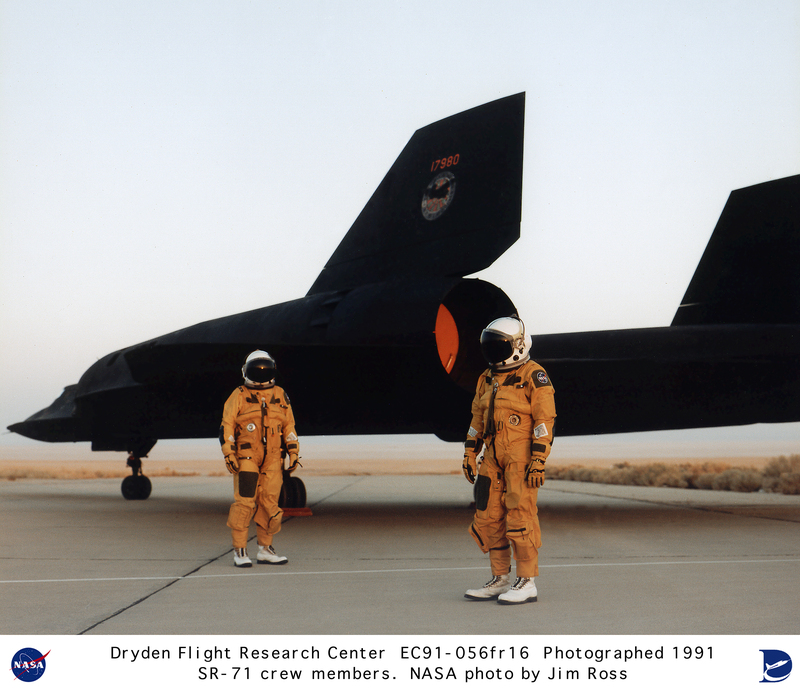 Keywords: SR-71; Dryden Flight Research Center; U.S. Air Force; sonic booms; Jet Propulsion Laboratory; LASRE; YF-12; Dave Lux; Steve Schmidt; Lockheed Skunk Works; Lockheed Martin; Pratt & Whitney; SR-71; Mach 3; Blackbird; high speed research; supersonic research.